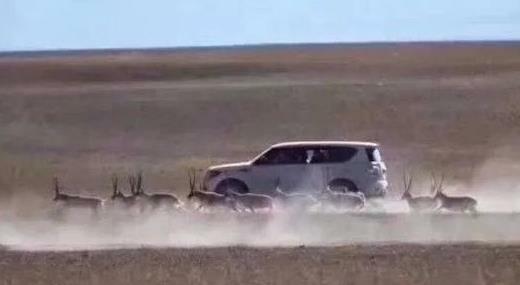 The tourists in two off-road vehicles left the designated travel route and chased a herd of Tibetan antelopes in Serling Co National Nature Reserve in Nagqu Prefecture last week. Seven tourists were fined for their auto racing with Tibetan antelopes in a national reserve in southwestern China's Tibet Autonomous Region. Although forest wardens patrolled over 300 square kilometers of area after the incident to examine the antelope group and found no evidence of harm to the animals, the tourists were fined 105,000 yuan (US$16,000) in total for "disturbing rare wildlife's living and breeding. The population of Tibetan antelope declined sharply from 200,000 to 20,000 due to illegal hunting in 1980s. Thanks to the habitat protection in the past decade, the population has recovered, but the plateau species is still listed among China's first class protected animals.